Nadene Janson, universally acclaimed as the kindest, sweetest, gentlest, most positive person people had ever met, died peacefully on Monday, May 2nd. 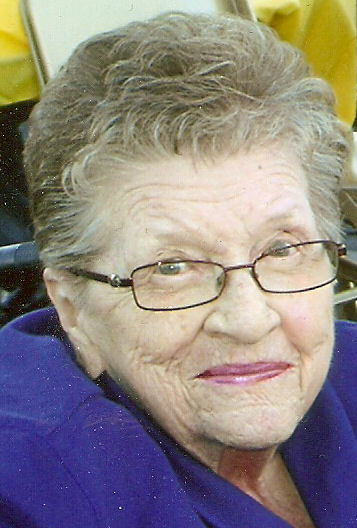 Survivors include her children, Brenda Janson, Lynda (Greg) Anderson, Sherry (Brad) Warren, and Charles (Marilynn) Janson; 12 grandchildren, and 28 great-grandchildren. Services are set for Tuesday, May 10th, 11 AM, with a 10 AM viewing, at the Salt River Stake Center, 6942 East Brown in Mesa. I am so sorry to hear about Nadene,but lucky to have known her.She was always so up beat and friendly to every one.I always looked forward to Sunday to see her in her chair and talk to everyone that went by the library I will truly miss her. I’m very sorry for your loss, and I wanted to offer you some comfort that I’ve found in the Bible. Isaiah 25:8 says “God will swallow up death forever, and the Sovereign Lord Jehovah will wipe away the tears from all faces.” This verse shows that soon death will be no more and soon we can see the loved ones we have lost again. (John 5:28,29) I hope this brings you so,e comfort and hope.